These fox tail keychains are made using faux fur. 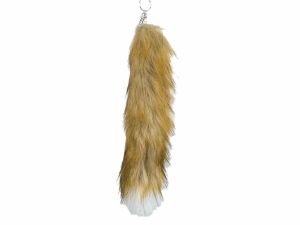 They are NOT real fox tails. They are currently sold as assorted colors (see the picture above for colors available). 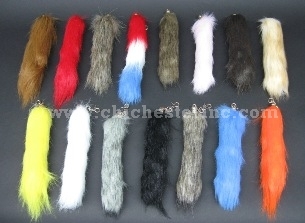 The imitation fox tails are 11" to 11.5" long and 2" to 2.5" wide. 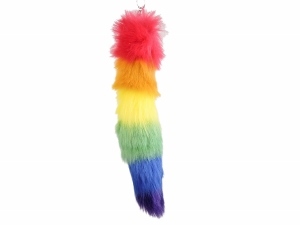 One fox tail keychain weighs 1.6 oz. One brown, white-tipped tail measured 14" by 3" in size, and one rainbow tail measured 14" by 3' in size. Both weighed 47 grams each. Please call us if you want a particular color(s) and we will let you know if it is in stock. Otherwise, we will send you assorted colors.